The main challenge in removing turbidity and organics from water supplies is to cope with impurities that are negatively charged at natural pH levels, and have formed a stabilised dispersion. Initially it is a matter of destabilising the dispersion and coagulating the contaminants. This is done by adding positively charged species in appropriate quantities to neutralise the charge on the impurities. A flocculation step involving a polymer is then used to bring together the particles so that larger floes are produced. In the terminology used here, the terms coagulation and flocculation are not synonymous. Coagulation is used in the sense of describing the process whereby the original dispersion is destabilised by overcoming the forces which maintain the stability, and flocculation to describe the process whereby the destabilised particles join together to form larger agglomerates . As well as the addition of an inorganic salt followed by a polymer to achieve these effects, the two processes can be achieved by the addition of only a single polymer. Coagulation with hydrolysable metal salts is a long-standing technology, the mechanism of which has been thoroughly investigated [19, 20], Charge neutralisation is brought about by the addition of aluminium or iron salts to form soluble hydrolysed cations and metal hydroxide floes, the relative amounts formed being dependant on the operating pH. Originally utilised as alum in the case of aluminium, the coagulant can be applied also as the polynuclear cation via preformed poly(aluminium chloride) or the corresponding sulfate. The salt residual is then reduced and it is found that the usage of coagulant can be up to 30% lower , The large inorganic species so formed is effective in neutralising the negative charge on suspended clay particles and natural organic material , The polymeric forms are better for cold waters and can be employed over a wider pH range than alum, but at greater cost. The small floes produced by coagulation with metal salts can be built up into larger agglomerates by subsequent treatment with a polymer, to form larger particles that have more rapid rates of sedimentation. This involves polymer bridging, in which polyelectrolyte bound to a floe particle has looped and dangling chains that can attach to further particles nearby. Long chain polymers that do not have a high level of charge give best results. One polymer chain adsorbs on two or more particles via an electrostatic or non-electrostatic driving force [23, 7]. It takes place when the surface is not completely covered, as in the initial stages of the process or when the polymer dose is low. It occurs immediately after addition of the polymer, and is very dependent on mixing conditions . The nature of the surface charge on floes formed by coagulation with a metal salt will depend on the dose of metal salt used. The net charge is normally close to zero, either slightly positive or slightly negative. In the first case an anionic polymer will increase the size of the floes by interaction with the positive sites on the floe surface . Bridging will occur when the adsorbed chains interact with another floe. Polymer characteristics normally favouring bridging are a low charge density (CD) and a high molecular weight (MW), with a minimum of 800,000 Daltons advocated. The CD maximum generally ranges from 5-15%, although levels as high as 45% have been effective in some instances [26, 27], Higher CD polymers have improved shear resistance, the transition occurring at a CD between 10 and 20%. Re-flocculation is incomplete at low CDs, but more or less complete at a CD of >12%. Bridging after shearing is also very dependent on chain length, with higher MW polymers giving better performance. Charge neutralisation takes place at low and high surface coverage, depending on the charges on the polymer and on the surface. Here the polymer has a passive role, merely acting as a multivalent ion, so the process is strictly coagulation , Polymer characteristics that favour charge neutralisation are substantial doses of a high CD, low MW polymer. Thus in jar tests on synthetic and natural waters of low turbidity and moderate to high colour, high CD cationic polymers are effective in removing the organics responsible for colour, and in lowering the production of trihalomethanes after chlorination [29, 30]. When the polymer dose is low, a mechanism known as the electrostatic charge patch model has been proposed . The polymer adsorbs where there are domains of opposite charge on the floe to that of the polymer, leading to a local excess of charge associated with the polymer, but leaving patches of the opposite charge on the floe , Direct electrostatic attraction between the patches on different particles results via domains of opposite charge, leading to flocculation. Thus when a cationic polymer adsorbs on a negatively charged surface, patches of positive surface are formed which may attach to negative patches on another particle, with no bridging chains being involved. Patch formation, like bridging, takes place when the surface is not completely covered, as in the initial stages of adsorption or with a low polymer dose. As it takes place immediately after addition of the polymer, it is very dependent on mixing conditions. It is a flocculation phenomenon, as the polymer has an active role in creating patches that link particles together. 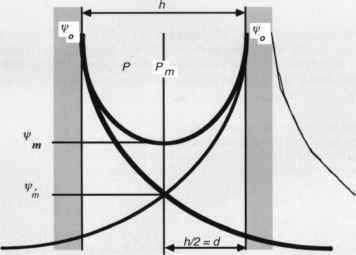 A characteristic of this model is that floes may reform after floe breakage. The patch charge model is favoured by low doses of a high CD, high MW polymer. A low ionic strength is preferable. Thus a patch charge mechanism is proposed when highly charged polymers adsorb strongly onto silicate mineral particles and silica, resulting in a low surface coverage . Fundamental colloid science studies of the flocculation of particles in very clean systems by well defined polyelectrolytes have been carried out over the years, covering for example latices, cellulose, silica, iron oxide and clays, as reviewed earlier , Generally there is a balance between two mechanisms: charge neutralisation with highly charged polymers, and inter-particle bridging when the polymer has a low content of ionic groups . There are particular issues of great practical importance, such as effects on reaction rates  and the size and strength of floes , which are found to be dependent on the CD of the polymer, its MW and the ionic strength.